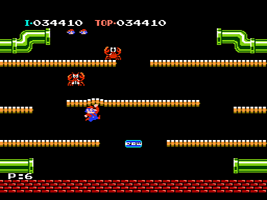 A port of the classic arcade game Mario Bros., released exclusively for the NES in Europe. Mario and Luigi must work together to clear the sewers of critters, while competing for Coins and points. This near-arcade-perfect port brings the graphics closer to those of the arcade game, and reinstates all of the elements from the arcade that were missing from the original NES version, such as the enemy introduction animations.